When I walked into &Pizza, a fast-casual pizza restaurant started in 2012 with locations in D.C., Maryland, Virginia, New York, and Pennsylvania, I was shocked. I visited the 14th and K, N.W. location across the street from the Washington Post. I was impressed that in addition to offering vegan crusts and a big selection of veggie toppings, they also offer plant-based meat and cheese toppings. But I knew that in advance of my visit. I expected to eat, hopefully enjoy the pizza, and write a review. But I didn’t know I would meet Yanique and Sequan. When I told Yanique I don’t eat animals or anything that comes from an animal, she showed excitement and began rattling off their vegan options–not the typical reaction in a pizza place. Her welcome began a discussion with her and pizza maker Sequan about vegan pizza and thoughtful eating. They were genuine, helpful, and eager to chat and learn. At this point, I hadn’t told them that I was visiting the restaurant to review it so this was them in all their unvarnished splendor. It was no act. They helped select my dough (ancient grain), sauce (classic tomato), and toppings, sharing their favorites along the way. Their product knowledge would have made the founder, Michael Lastoria, proud. I later learned that he places a heavy emphasis on culture. It shows. I imagine they earned a perfect score on the &Pizza test. Yanque talked to me about the business model while Sequan told me about his efforts to eat less meat. I listened and discussed the ease and joy of plant-based eating. They were interested, asked questions, and praised the benefits. 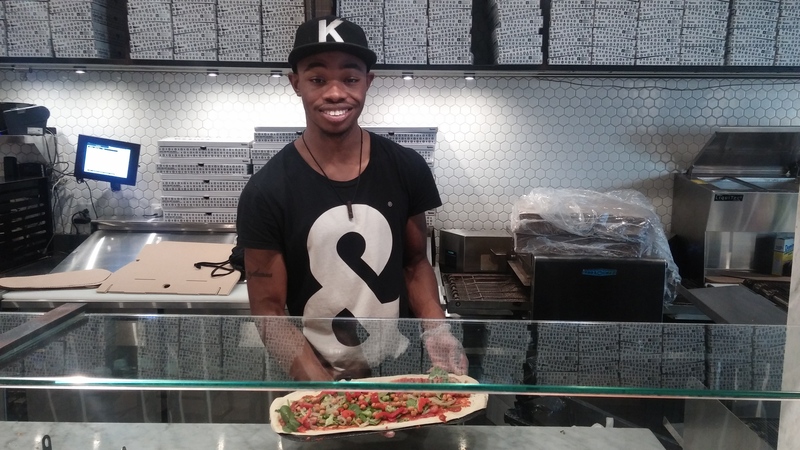 “Does &Pizza do good hiring, good training, or both?” I asked Yanique. She laughed. She was too humble to answer. As I worked my way down the line, they were all smiles. It felt like it was their restaurant and I was their first guest. It turns out Yanique has only been working there 10 days. I watched her positively interact with a child on the line as I ate. 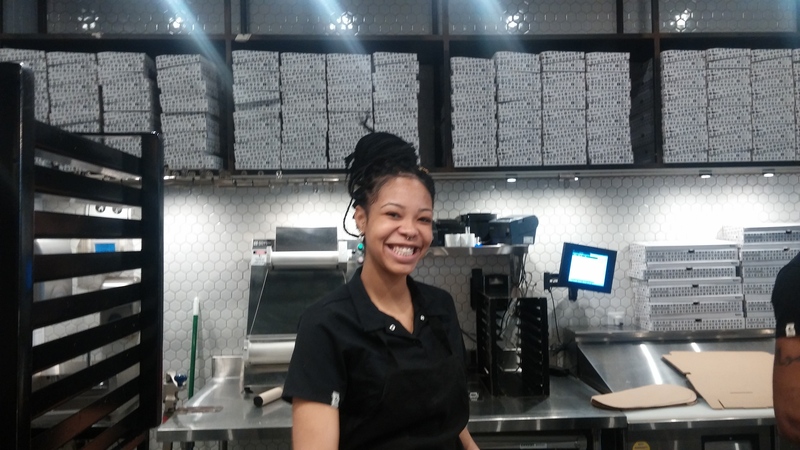 Her polished communication skills, flair, and natural disposition represent &Pizza well. Both of them were incredibly accommodating to guests, offering to do whatever it took to satisfy them. If their management team could see them in action, they would do cartwheels through the dining room. While I was eating, Sequan checked on me to see if I liked the pizza. When I was finished, Yanique thanked me for coming and told me she hopes I return. Before I left, I told them I was visiting for the first time to review the restaurant. I explained that based on their performance, I was going to feature them in my review and call their corporate management to let them know how impressed I am with them which I have since done. I told Yanique and Sequan they’re special. They were smiling from ear to ear. They told me how much the feedback meant to them. It’s such an honor and it’s so rewarding to meet and be able to acknowledge people doing extraordinary work. Restaurants owners can either make excuses why they can’t get the customer experience right or they can hire people like Yanique and Sequan, train, manage, verify, recognize, and reward. I don’t know if everyone at &Pizza has the same positive energy but when I spoke with a manager at another restaurant about some of the messes I’ve encountered, she told me she actually wanted to recruit employees from &Pizza because they have such good people. There’s probably more to it than that. At this point, I didn’t care if the pizza tasted like cardboard. If it was mediocre, I would return to see my new friends Yanique and Sequan. As if I needed another reason to like this place, the pizza exceeded expectations. I chose a whole grain crust, tomato sauce, and took advantage of their model that allows unlimited toppings for a fixed price ($9.95). I selected broccoli, chickpeas, grilled onions, tomatoes, spinach, peppers, basil, and kalamata olives. I skipped the vegan meat and cheese to keep it healthier but they told me they’re popular. Huge props to management for going the extra mile. It’s telling that a new small chain like &Pizza can add these options and many of the big players in the field that have been around for decades are still dragging their feet on plant-based meat and cheese. The restaurant is clean and the pizza cooks fast. It’s crispy, folds easily, and it’s delicious. I tried pizza at a similar pizza place called Blaze and the pizza tasted like wood shavings and the veggies were drained of flavor. At $9.95 for an &Pizza pie that will satisfy a hungry person, it’s also reasonably priced. Yanique and Sequan reminded me of the possibilities at a restaurant. They’re a shining example that a job is what people make of it. There is no shortage of pizza restaurants. But I would walk past several other pizza places just to see Yanique and Sequan. &Pizza is delicious but these two winners are the secret sauce. Great! Business owners need to realize that their employees can make or break their business no matter how great a product they may have. Employees should be paid well, trained well, and treated with respect. Hopefully, if this recipe is followed it will make them shine and cause the establishment they work at to become successful and profitable. Sadly, the majority of companies and business owners fail at this. Thank you so much Andrew! This review meant a lot to us and I was very honored to have served you. Please come back again soon! Happy New Years to you as well. Sequan!!!! You guys were amazing! It was an honor to meet you. You’re both special. Keep shining! Thank you for making my experience so enjoyable! &Pizza is very lucky to have both of you on the team! MOD Pizza in Coeur d’Alene Idaho is the same, they don’t offer vegan meat, but offer vegan cheese and tons of veggies. The employees are as helpful and energetic as well. Here’s to &Pizza going nation wide! Awesome recommendation Elizabeth! I’m glad you found a good pizza place you can enjoy! Thank you for your kind note Janet! I’m so glad you find them helpful. Thank you Maria! I’m glad to hear it! Wonderful news!